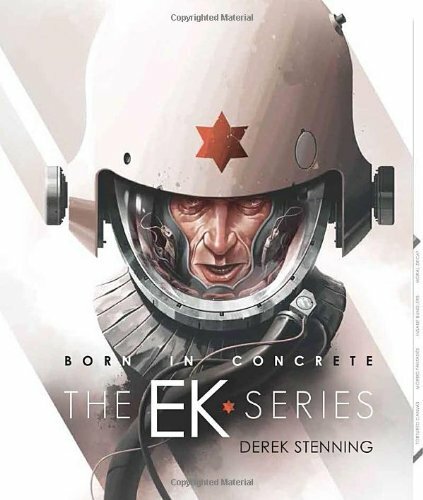 Born in Concrete is an artbook collecting some pretty amazing paintings from concept artist and illustrator Derek Stenning. The first thing that grabbed my attention is the size of the book. It's not very thick with 96 pages but It's big. The artworks do have the additional impact when they are printed huge. It's a pleasure to see them are large sizes. EK stands for Entartete Kunst which translates from German to English to mean Degenerate Art. It's a term used during the Nazi regime in Germany to describe modern art. The subject inspired Derek Stenning to create something of his own and the theme you see in the book is one of sci-fi, mystery, and hidden symbolism. Most the paintings involved cosmonauts that are attached by wires to mysterious floating orbs. Occasionally, there's some industrial complex in the background, which can be floating or on ground. The artworks are really beautiful and detailed. I love the use of colour tint that gives each piece a different mood and atmosphere. The mysterious nature of each painting also helps to attention to it, to invite the audience to think about what they are looking at. You may not know what the cosmonauts are doing, but you'll be captivated nevertheless. There are also some examples of the artworks being used on snowboards, on magazines and exhibited in a gallery. I can only imagine how awesome it would be to have one of the artworks as a huge painting hanging at home. Also included is a step-by-step tutorial on the creation process which is a mixture of illustration, digital painting with Photoshop and 3D modelling to create certain elements. This is a great artbook. Highly recommended. The book seems to have two publishers, Design Studio Press and Titan Books.